I decided to have a look at the mission site this morning to see what NASA was saying about Endeavor and possible damage to it's underbelly. Nothing too revealing there, according to the site Endeavor's crew is preparing for a scheduled space walk with a number of goals in mind, all related to the International Space Station. The only clue that there might be concern is in the following statement: "Meanwhile, the Station-to-Shuttle Power Transfer System, which was activated after Friday’s docking, will be shut down during the spacewalk. The transfer system may allow Space Shuttle Endeavour and the STS-118 crew to stay at the station longer. A decision on a possible mission extension is expected to be made Sunday." Image of astronauts preparing for space walk. 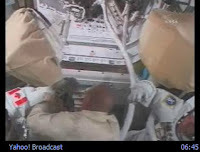 Check out NASA TV (Yahoo!) for space walk coverage. A music downloading service that opened in Canada earlier this year is now hitting the road to offer its music in the U.S. The ad supported service, SpiralFrog, features more than 700,000 tracks mostly from Universal music and independent labels. There is a download manager which is not compatible with iTunes, and users are required to keep their membership current or they are cut off from the service. If a membership is not renewed within 30 days, download privileges are cut off and after 60 days the songs will no longer play. Membership is free and completely supported by ads. CBC Story here. To be honest, I haven't tried the service so I'll have to reserve judgment. The titles seem a little limited but then again so are Amie Street's and I'm liking that service. Endeavor astronauts have discovered a possibly worrisome gouge in the under belly of the space shuttle. Endeavor is currently docked with the International Space Station and it's crew will use the Canadarm to have a closer look at the damage on Sunday. NASA says a space walk could be used to repair damage but it is not yet known what the extent is. CNN story here and video here. iPhone dead zone - rotten Apple? The Apple Insider is reporting an iPhone issue that affects the touch screen of some machines. Users are saying their iPhones are developing a dead zone on "a half-inch strip of the screen that spans the width of the device when held vertically." The repair is taking Apple 3 days on average and users are being offered a rental unit for $29 during the repair! I find this a little hard to fathom, you mean to tell me that after laying down $500 or more for a machine, that breaks within the first month, I'm going to have to pay you ~6% of the purchase price to rent a loaner! Unbelievable... tell me it ain't so Steve! For the first time since it's release, I'm happy that it's not available here in Canada yet. Got questions? Ask a Ninja! Ask a Ninja has been a favorite of mine, for a very long time, and I thought it was high time I let you all in on the secret. You may already be aware of the site, if so go there again you won't be dissapointed. It's a classic, and well worth a look if you are seeking a few chuckles or some gripping advice from a stealthy warrior in black. But be careful, the self proclaimed "deadliest thing on the webernet" looks forward to killing you soon! Business Week has a product review of the new Timex Ironman iControl watch. The device which acts as a remote control for your 5th gen iPod is reported to preform well, and is simple to operate, although the reviewer found it a tad bulky and perhaps over priced at $125 US. My iPod resides permanently within the upper pocket of my SCOTTEVEST, so while it is easily accessible I can see the merit in having an external device capable of navigating through my play list. I tend to agree on the price issue though, perhaps it will fall given time. BBC is reporting that Universal Music will try DRM (digital rights management) free music sales from August to January "and analyze such factors as consumer demand, price sensitivity and piracy in regards to the availability of open MP3s." This is certainly an about face for the music industry and hopefully a step in the right direction. Perhaps the music industry is finally getting it! 50 Cent, the Black Eyed Peas, and Amy Winehouse are all artists signed to the Universal label. Google, Wal-Mart, and Amazon.com are said to be participating in the experiment. We've all received the annoying e-mail spam offering cheap pain relievers or erectile dysfunction drugs, and in many cases what you'd receive, if you actually fell for it, is counterfeit medication. IBM has created a system that it calls "ePedegree" to track medications from the manufacturer, to the pharmacy, and all points in between. Using RFID (radio-frequency identification) tags similar to those already employed in the retail industry, the system allows the drug companies to create electronic certificates of authenticity for medications. It's a cat and mouse game however, as other measures have already been employed only to be faked within a few months. IBM says the system has other uses "for keeping track of expiration dates, batch numbers in case a drug is recalled, and so on." Globe and Mail story here. Microsoft has announced that North American preorders of the highly anticipated Halo 3 title, exclusive to the Xbox 360, have surpassed the 1 million mark. According to the press release "demand has been so strong for the Legendary Edition of the game that it is expected to be sold out by the time the game launches on Sept. 25." The landmark is, at least partially, contributed to the support of major brands like Mountain Dew and 7 - Eleven. "For the first time in video game history and on par with the scope of major movie releases, some of the world’s biggest consumer brands have aligned to support the launch. Many plan to offer a variety of promotions that give consumers the opportunity to obtain unique “Halo 3”-branded products and prizes and participate in one-of-a-kind “Halo 3”-themed events." We've been contemplating getting our preorder for some time now, I guess we'd better stop procrastinating... it's not like we're not going to get it! It's Halo 3! Earlier this week Amie Street, the popular music download site that prices music according to the number of downloads, announced that it had received an investment from Amazon.com. Also this week there have been some works of several classic big names added to the download collection. If you are a jazz lover check out Louis Armstrong and Ella Fitzgerald. Other notables include the King himself, Elvis Presley, and comedian George Carlin. As always, the real nuggets are the up and comers who are taking advantage of this fantastic platform to get their music out there. Let's not forget that it's all DRM-free! Get over to Amie Street fast to get in on the real deals. c|net's News Blog, is reporting that in the U.S. version of Google News, a user who is somehow involved in a story will now be able to comment on it. There is a verification process that involves submitting your comment and credentials to a special e-mail address, and verifying your identity via domain name, the process concludes with a follow-up from Google staff. The idea is to limit the commenting to the experts involved in the story. It's an interesting idea but apparently not a novel one as Yahoo! tried a similar system but abandoned the idea, at least temporarily. It seems that Yahoo! didn't keep as a tight reign on things and suffered from comment spam. Here is an example as cited by News Blog. MySpace has inked a deal with The Onion to provide it's satirical audio, video, and print content to a branded Onion page within the social networking site. First up is the Onion News Network available on MySpaceTV portal. In typical Onion style Sean Mills, president of The Onion, is quoted as saying "The news business is like the tobacco business: you want to reach new readers at as young and impressionable an age as possible," Gotta love the Onion! A few weeks after the big launch of the iPhone, Steve Jobs was at it again, and this time he is returning to his roots. Today Apple announced two new sleek aluminum iMac's with a 20 or 24 inch monitor. Depending on the configuration, a new iMac will set you back between 2 and 3 iPhones ($1199 - $1799 US). I've always appreciated Apple's designs and the new iMac does not disappoint, it is simply beautiful! According to her blog, Veronica Belmont's new show will be called "Mahalo Daily" and will be launched in September. There are no further details in her post other than a few pictures of her new digs at Mahalo HQ. I have to admit, I'm more than a little jealous of all those big LCD displays! Compared to the cubical that I dwell at my day job, the Mahalo office looks much more open and inviting, though I'm not sure my work could be conducted under such close quarters... Mahalo HQ looks hip, and everyone looks relaxed! Are you sure it's not just one big LAN party Veronica? We are all anxiously awaiting the debut! Morgan Webb of G4tv's X-Play fame has taken her act to the web. webbalert is a new semi-daily video podcast that Morgan hosts bringing you all of the days tech stories in 5 minutes or less. Her on screen prowess shines through, the podcast if rather well produced and covers the hottest topics. I've added you to my iTunes feed Morgan... good luck with the show! "The force is due to neither electrical charge or gravity, for example, but the fluctuations in all-pervasive energy fields in the intervening empty space between the objects and is one reason atoms stick together, also explaining a “dry glue” effect that enables a gecko to walk across a ceiling. Now, using a special lens of a kind that has already been built, Prof Ulf Leonhardt and Dr Thomas Philbin report in the New Journal of Physics they can engineer the Casimir force to repel, rather than attract." The initial uses are seen as allowing Micro or nano machines, such as those that trigger a car's airbag, to run smoother with less or no friction. A long way from the hover board I'm afraid but a step in the right direction! Nanaimo, British Columbia has embraced Google Earth and currently has the distinction of being the most zealous of contributors of geographic data, to the mapping search engine service site. With the blessing of his bosses at city hall, programmer Jason Birch spent his evenings and weekends for 2 years experimenting with images, colours and the programming language KML. The object of the experiment was to provide tourists and residents with geographic data, and boy have they... 10 centimetres on the ground in Nanaimo equals one pixel on Google Earth, this resolution is significantly higher than maps covering the rest of the world, typically 1 meter equals 1 pixel. Kudos to Jason and the City of Nanaimo, it's thinking like this that will serve your jurisdiction well! Globe and Mail Story here. For some time now the blogosphere has been a buzz about the writings of "Fake Steve Jobs" (FSJ) on his blog "The Secret Diary of Steve Jobs". The blog has been running for 14 months with the writer's true identity under wraps, and it's been something of a must read. Their has been much speculation but the true identity of FSJ has finally been revealed. How do I say this, the real fake Steve Jobs is Daniel Lyons, a senior editor at Forbes magazine. Lyons says that after being outed he is going to take a few days off to sit in a lake and do yoga, but will return as FSJ with Forbes as his sponsor. There's something fichey going on around here! If you are old enough to remember microfiche technology then you'll probably get the name, Fichey. The site allows you to quickly move around the top stories of the day from sites like del.icio.us, digg, downfly, reddit, and StumbleUpon. It's a web 2.0 app that takes snapshots of these sites, providing the top stories, that you can then browse as an image, navigate to the next one, or double click on to be sent directly to the page. It's reminiscent of the old microfiche so it is aptly named. I like it, only wish I could choose my own sites! Not that there is anything wrong with Fichey's choices, it could be useful to me if I could direct it elsewhere, that's all. c|net's News.com is running an article about a NASA sponsored competition that seeks to find the most fuel efficient personal aircraft vehicle (PAV). The competition is being held at Charles Schultz Sonoma County Airport in California, conjuring up images in my head of Snoopy cruising around on his dog house, but I digress. "These air vehicles can travel in three dimensions without any traffic jams, and the computer technology today enables travel that can be on demand at speeds three to four times faster than cars with equivalent gas mileage." If these guys get their way, we might all be flying our cars to work someday in the not too distant future. Think "The Jetsons" or perhaps "Blade Runner".